That crow won't keep me awake again! Lambeth born Chris Morris is best known for the series of spoof documentaries he produced for TV called Brass Eye. 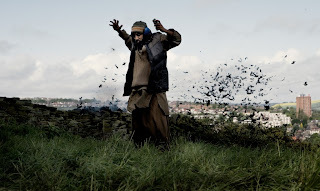 His latest controversial project and incidentally his debut feature film, has been described as “a jihad satire” it follows a radical group of Islamist from Sheffield England as they plan a terrorist attack on the London Marathon. Four Lions (2010) was also part written by Morris who spent the last five years arranging finance and researching the project speaking to all types of experts as well as ordinary Muslims and insists that this research took place before the 2005 London bombings. The film presents itself as part of the grand British comedy tradition of mockery “The specific art of ridicule or derision: sarcasm: making fun of” certainly this directory definition is an accurate description of Morris’s movie. Unfortunately not all terrorism is carried out by berks like the four Asian Muslims and “one white bloke” who form this rather hopeless terrorist cell who manage to get themselves thrown out of a al-Qaida training camp in Pakistan and unintentionally blow up some sheep along with a member of the group, but sometimes it can succeed at a devastating cost to human life. This inflammatory topic divided critics between those that thought the subject was in bad taste and those that thought it hilarious. I personally did not want to like Morris’s movie but I must admit that I did just that, it’s a very funny spoof but if your easily offended don’t go to the cinema or buy the DVD.